In every dog owner’s life there’s a moment where she knows she’s made a terrible mistake. Whether it’s that trip to the emergency vet when the dog eats a box of raisins or the time the back gate was left open forcing a neighborhood wide dog hunt, things go wrong. But sometimes dog owners don’t realize their actions have caused harm. This is especially true when it comes to pet obesity. More than 35 percent of dogs in the U.S. are overweight and another 18 percent are obese, defined as greater than 30 percent normal or ideal body weight, according to the Association for Pet Obesity Prevention (APOP). It’s a figure supported by local veterinarians, who say it’s the most commonly diagnosed disease in their practices. Overweight and obese dogs are at risk of many health problems. The extra strain on joints can lead to osteoarthritis, cruciate ligament injury and hip dysplasia—huge quality of life issues. 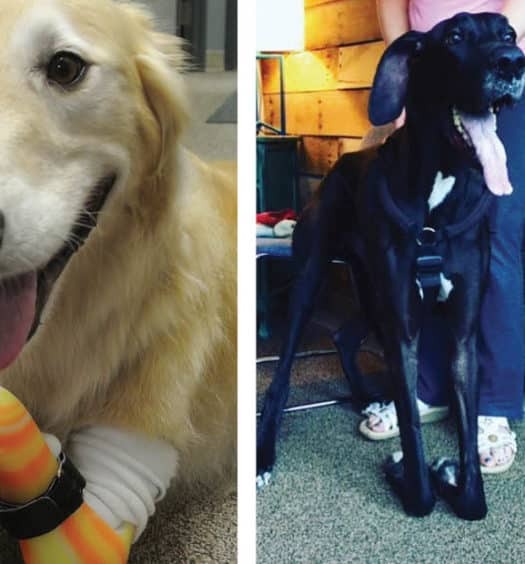 One study showed as many as 25 percent of overweight dogs had serious joint complications, notes Dr. Jennifer Moulton, DDS, owner of Cherished Companion Mobile Veterinary Services in Reston, VA. Overweight dogs are at risk of diabetes, high blood pressure, heart and respiratory disease, pancreatitis, kidney disease, heat stroke and many forms of cancer, including bladder and mammary tumors. They are more likely to have trouble with anesthesia due to difficulty breathing and have a harder time giving birth. They are gassier than slimmer dogs, are more susceptible to infection and are prone to skin issues due to excess skin folds that rub or have reduced circulation, Moulton says. Worst of all, an overweight dog’s life expectancy can be cut short by at least two years. Part of the problem is that different breeds have different physiques. Greyhounds have slim waists making them hard to compare to pugs. Meanwhile, the public has distorted ideas about how pets should look. Common wisdom says a dog at an ideal weight should have an obvious waist with ribs that are easily felt but not seen. One easy way to test this is to feel around the chest area. If you can feel the rib area, the dog probably isn’t too overweight. If you can pinch an inch or more of fat or have trouble feeling the rib cage, you have a problem, says Moulton. She also recommends looking at a standing dog’s gluteal fat pads—the dog equivalent of love handles—below where the waist should taper. If that area starts bulging out, the dog could be too heavy. Dogs are gaining weight for many of the same reasons as people: sedentary lifestyles and too much food. Veterinarians specifically point the finger at treats, with owners frequently rewarding dogs with treats instead of affection or play time. Meanwhile today’s dogs don’t have to compete for food as much as they used to, believes Moulton, and the food they get is higher in calories. There are other factors. Like people, dogs’ metabolic rates decline as they get older, making it easier to gain weight. Dogs between the ages of 5 and 12 are most likely to be overweight, says Moulton, and a mature dog may need 20 to 40 percent fewer calories than a young dog. Female dogs are especially susceptible to being overweight as are certain breeds including: Retrievers, Rottweilers, Bernese Mountain Dogs, Newfoundlands, St. Bernards, Cairn Terriers, West Highland and Scottish Terriers, Shetland Sheepdogs, Basset Hounds, Cavalier King Charles Spaniels, Dachshunds, Beagles, Cocker Spaniels, Labradors and Schnauzers. Some cases may be a result of thyroid or other undetected health problems. Both diet and exercise are equally important when helping dogs shed excess weight, but from a real-world perspective it’s easiest to address food, says Melberger. He also discourages giving dogs human food, which contains far more calories than dog food. 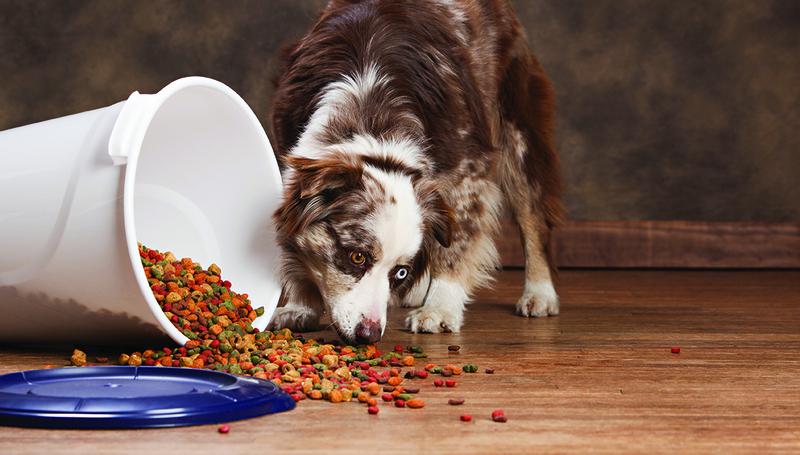 When it comes to dog food, Melberger suggests dog owners round down to the nearest convenient size when taking portion recommendations from dog food packages. If a package says feed 7/8th of a cup, measure ¾ instead. Then track the dog’s weight to see if it’s the right amount. Ideally a dog on a diet should lose one to two percent of its body weight a week. That means a 50-pound dog could comfortably lose a half to a whole pound weekly. Pushing weight loss too fast can be dangerous and dog owners should consult their veterinarians before putting a dog less than one year old on a diet, says Moulton. She recommends starting by cutting back food by 15 to 25 percent. Prescription food is available and the FDA recently approved a new prescription drug to help dogs lose weight, but those tend to be last resorts. 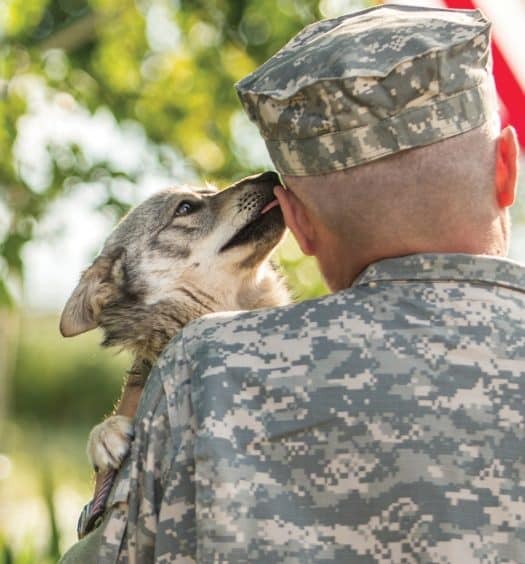 As for exercise, a study in the Journal of American Veterinary Medical Associates found that less active dogs have less active owners, meaning dog owners can help their dogs shed a few pounds while also helping their own health by taking their dogs for more walks. Owners just need to start slowly with pet exercise, working their way up and paying attention to how the pet responds, says Melberger. “Are they stiff and store? Slowing down in the middle? Wanting to stop and go home? Gauge your pet’s response,” he says. Many pet owners report omega fish oils help reduce joint pain, making it more comfortable for a dog to exercise, says Moulton. As more dogs are labeled overweight, owners need to pay more attention to their dog’s size and take it seriously if the veterinarian says a dog needs to lose a few pounds. Ignoring the warning could be a fatal mistake. Kelly Pike is a freelance writer in Annandale, Va. She does her best work when her Beagle mix, Lola, is snoring away next to her. Reach her at kellykpike@yahoo.com. An astounding 95 percent of dog owners don’t know that their dog is overweight. It’s an easy mistake to make. It even happened to my beagle mix Lola. The problem began when my first child was introduced to table food. Not content to simply eat the food I gave her, she generously showered a smorgasbord of bread, pasta, and chicken nuggets over the side of her high chair tray and onto the floor where Lola lay eagerly below. Exhausted by parenthood, I gladly let Lola clean off the floor, viewing it as a symbiotic relationship like the pilot fish that hang around sharks eating their leftovers. Lola got a snack. There was less to pick up off the floor. Everyone wins! Except not everyone was winning. Lola was gaining weight—and fast. Her annual checkup revealed that her formerly 35-pound frame was now closing in on 40 pounds—a 14 percent weight increase in less than a year. I hadn’t even noticed. Fortunately, Lola’s problem was corrected easily through diet—she was already enjoying two walks a day. First, we reduced her serving size of kibble to account for all the inevitable snacks courtesy of the baby. Second, we stopped eyeballing her food servings and started using a measuring cup. At her next vet visit, she was back to her proper size—and no one else has asked when her puppies are due. Wonder how much exercise your dog gets when you’re away from the house? Following on the heels of the Fitbit craze, companies have developed wearable technologies and apps to track dogs’ activity, sleep patterns, and even vital signs to help owners monitor their dogs from afar. This information can be used to determine if a dog is getting enough rest and exercise—and in some cases predict if a pet is under the weather. Many of these devices attach to a dog’s existing collar and interface with an app that allows owners to monitor their dogs with a smartphone or other device.